The day after Thanksgiving, I packed up the last of the Thanksgiving decor and pulled all the boxes of Christmas ornaments and decorations out of the garage. My husband and I wrangled with the artificial tree until it was set up just perfect, each branch where it should be. The kids and I put ornaments on, one by one, while I told the story behind each ornament we’ve collected since we were first married 13 years ago. It was a good day. Setting up the tree and decorating the house injected a burst of Christmas spirit into our home that day. The only thing I felt was missing was some holiday baking. 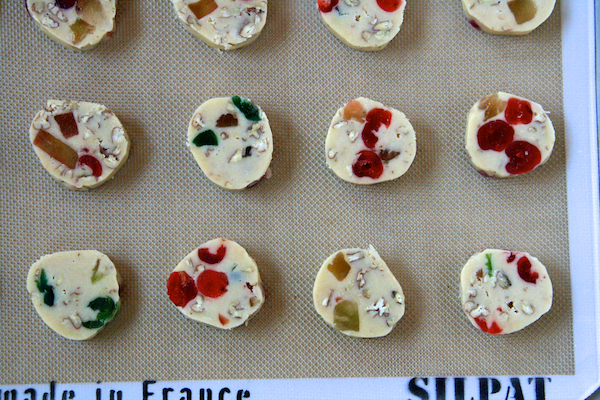 Fruit cake cookies were the perfect choice to usher in the holiday season. My husband first introduced me to these cookies when we were dating, back when the earth was still cooling. 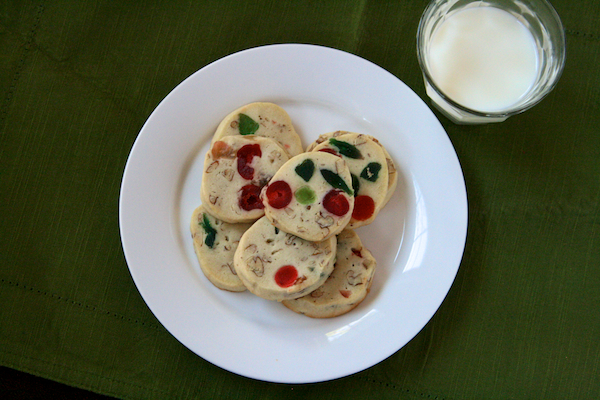 The fruit cake cookie recipe was one of his Grandmother’s specialties, a treat she made for the family each Christmas. 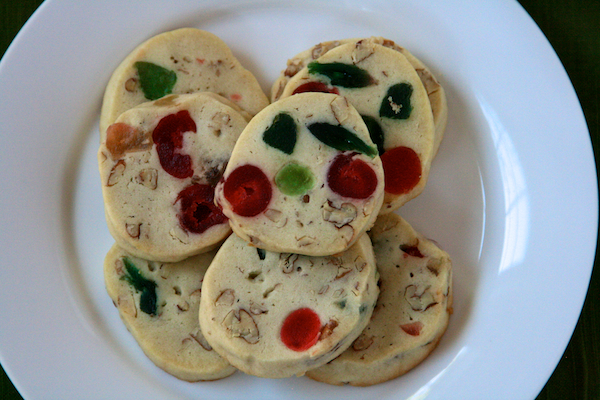 I admit that when I heard the name – fruit cake cookies – I was skeptical. I am NOT a fan of fruit cake. I just don’t get it. But these cookies? I love them. They have just the right amount of sweetness, but definitely not overwhelming to the senses. 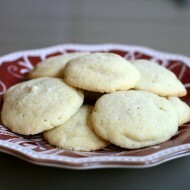 The texture – soft and a little crumbly – reminds me of shortbread. 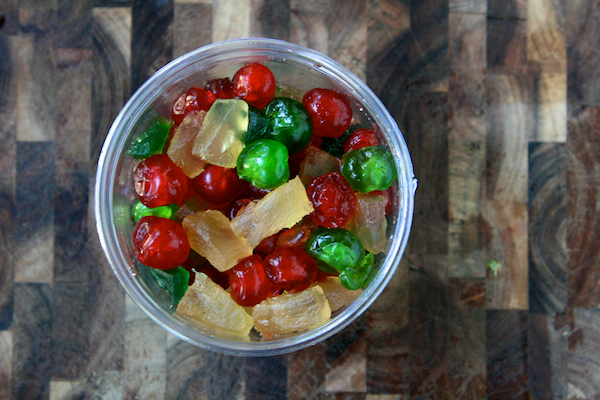 The fruit cake-ness (yes, I just made that up) comes from the addition of colorful candied cherries and pineapple. The dough is shaped into logs, chilled, then sliced into cookies and baked. Each slice of the knife cuts through those cherries and pineapples, giving the cookies a stained glass – or fruit cake – appearance. Over the weekend I baked up a batch of these colorful sweet treats with my kids, and they loved the whole process – from tasting the candied cherries, to adding the flour to the mixer, to tasting the final result, still warm out of the oven. Yep. It’s beginning to look a lot like Christmas around here. 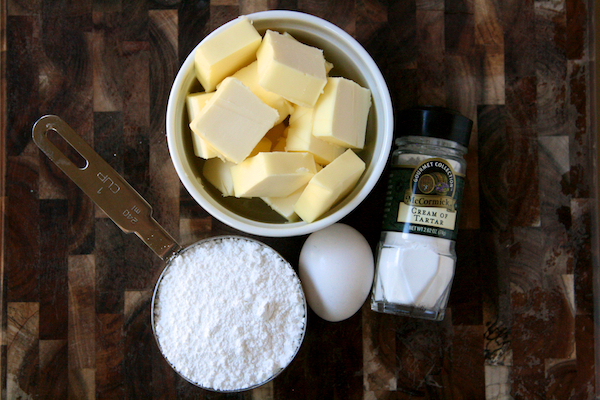 Using a stand mixer (or handheld mixer), cream together butter, powdered sugar, and egg. In a separate bowl, whisk together flour and cream of tartar until well-incorporated. Add in flour mixture to butter mixture slowly, blending after each addition until dough forms. Stir in remaining ingredients (candied cherries and pineapples, pecans).Turn dough out onto wax paper and divide into two equal parts. Roll each into a log, 2 1/2 inches in diameter. 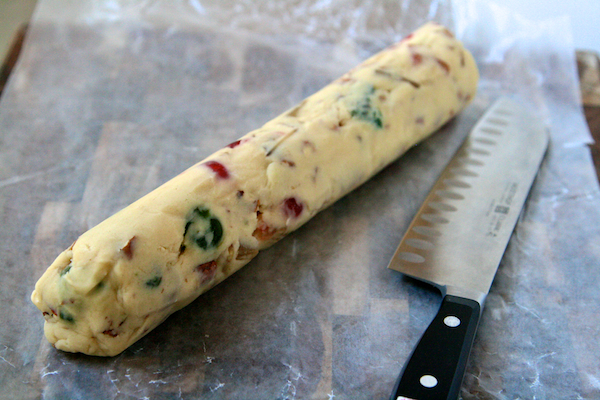 Wrap in wax paper and freeze until firm, approximately 1 hour. Place oven rack in middle position and preheat to 375 degrees F. Slice each log into 1/4 inch thickness. 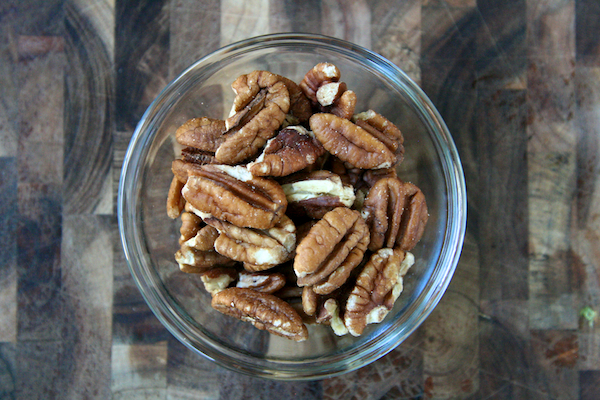 Bake for 12-14 minutes or until light brown. Cool on a wire rack until room temperature. That cake looks so tasty! I love blackberries so this recipe is something I plan to try. Plus, they’re good for you so you never have to feel guilty about eating 1/2 the cake by yourself, right? BTW, your helper looks like she did a wonderful job! Super post girls! This cake looks wonderful…my kid’s are my best kitchen helpers, too! I adore anything with blackberries. What a sweet post! I remember berry picking in the summer, good times! It makes me sooooo happy to see your daughter cooking in the kitchen with you! And she’s absolutely adorable to boot – not to mention that cake! what a perfect looking cake!! Looks like you had some great help with it! 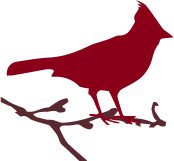 your images are excellent! 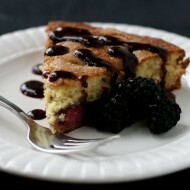 Oooh I saw blackberries on sale at the grocery store, just might have to run back and pick them up to make this cake!! I love berry cakes, delicious. The cake looks delicious–I don’t think I’ve ever made dessert with blackberries before. The Gourmet Raspberry Buttermilk cake is a favorite and I’ve been meaning to try other fruits so this is perfect. 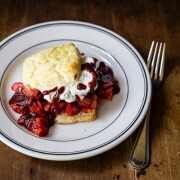 This is a great addition to the Gourmet, Unbound June entries!